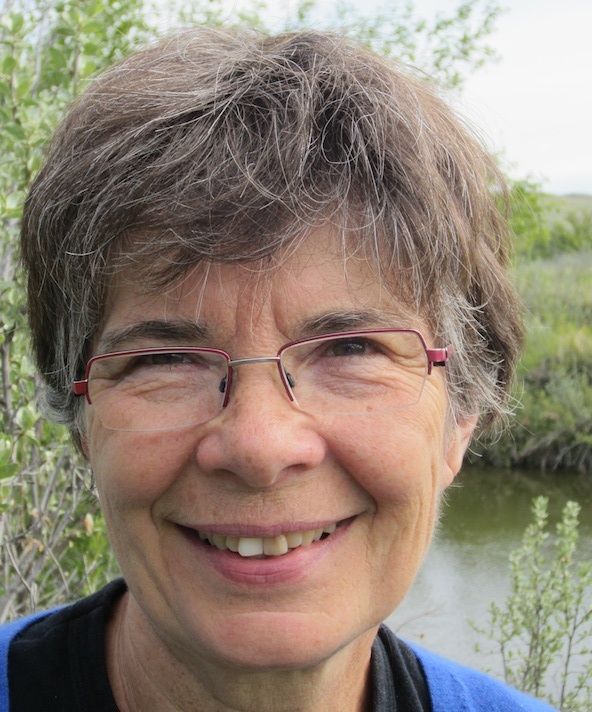 Candace Savage is the author of more than two dozen books on an impressive breadth of subjects—from in-depth books on natural history such as Prairie: A Natural History, Aurora: The Mysterious Northern Lights and Wild Mammals of Western Canada, to literature for children. A distinctive voice of western Canada in conversation with the world, she has earned an international reputation that is evidenced by her many awards and honours including the $60,000 Hilary Weston Writers’ Trust Prize for Nonfiction; induction to the Honour Roll of the Rachel Carson Institute at the Chatham College of Pittsburgh in recognition of her lifetime contribution to environmental awareness; induction to the Royal Society of Canada; an Honour Book Award in recognition of outstanding achievement in Children’s Literature; two Saskatchewan Book Awards; an Independent Publishers Award; and many others. I met Candace when she gave an intimate reading of her latest book, A Geography of Blood, at the University of British Columbia. As a nonfiction writer, I was inspired by Savage’s lyrical presentation of a nonfiction topic that so easily could’ve been delivered dry and boring by less talented hands. After the talk, I asked Savage if I could interview her. Your latest book, A Geography of Blood: Unearthing Memory from a Prairie Landscape, won the Hilary Weston Writers’ Trust Prize for Nonfiction. Can you tell me how that felt? Were you surprised? What has winning the prize, and the recognition that comes with it, meant for you? I was astonished. Until the call came to say the book had been shortlisted, I’d never even heard of the award—this is just its second year—and even after I’d won, it took me a while to understand what a big deal it was. The richest literary award in the country: really? for me? Obviously, you have to take all awards with a huge grain of salt—how could one book be the “best” in any absolute sense?—so win or lose, it’s all a bit silly. But winning feels very good, and the recognition has definitely increased the demand for my services. Some wit once observed that money is the sincerest form of compliment, and I feel suitably affirmed. You begin the chapter “Modern Times” with some archaeological information about the site Chimney Coulee. At one point, you write, “Although the police were here on and off for the next three years, with a garrison of up to ten men, every surface trace of their presence has vanished. Not far underground, however, the archaeologists found the remains of a log structure where the police post had once stood and, as one might perhaps expect of a bachelor roost, an inordinate number and variety of lost buttons.” When I first read this, I was delighted by this little detail. Then I started to think about all the source material you must have read and distilled in order to offer this rich detail. Having worked in UBC’s Department of Anthropology, I realized that what you presented briefly in such a fun and quirky manner might have only come after reading many pages of dry material. Can you talk a little about what went into researching this book? I’ve read reams and reams of boring stuff in my time. In fact, if I have a specialty, I’d say that it’s taking the dry husk of scientific and scholarly discourse and pumping blood back into its veins. A kind of revivification. I’ve always been struck by the contrast between the researchers I know, who are alive with need-to-know and fizz, and the deathly dull writing they feel compelled to produce. For this book, I amassed four large cardboard boxes crammed with scholarly monographs and papers, a thick wad of index cards, hand-written transcripts from the archival gold mine known as Record Group 10 (Indian Affairs), a shelf of books on related subjects and a stack of scribblers in which I responded to what I was learning and kept track of my travels and experiences. I was hoping to find lots of brilliant writing in those notebooks, which I could paste directly into the manuscript, but no such luck. Still I’m sure that those conversations with myself helped me figure out what the book was about. I was afraid you were going to ask that! I signed the contract in 2004, and the book came out last year, 2012. In my defense, I can only say that life intervened to keep me away from my desk for part of that time. Both my parents died, and my partner suffered and survived a serious illness. I also wrote one other book and updated an earlier title for a new edition during that span of years. Nonetheless, Geography took a long time, first to understand the story I needed to tell and then to do it justice, as best I could. There were many times when I wondered if I’d ever get it right—but then, that’s nothing new for me. I’m always more or less scared. And yet somehow or other, so far at least, things have always gelled in the end. Writing takes so much patience! I have to say that your writing kept me on my toes. Twice you present to the reader imagined interviews with deceased subjects; throughout the book, you slip between first person, second person, and third person; occasionally, you tell stories in the past tense, while at other times you relate a story in the present tense. Were these shifts intentional or intuitive? How did you decide how you would share each piece of the story? Some of the shifts were deliberate. For instance, the idea of interviewing the late Wallace Stegner came to me one day when I was putting myself to sleep with “on the one hand” and “on the other,” trying to be fair and succeeding only in being boring. What if I could just speak to him directly, I thought. Could I get away with that? And having tried it once, I knew I would have to do it again, so the interview format wouldn’t look like an aberration. Some of the other shifts—like the disappearance of the first-person narrator as we tumble into the heart of darkness—were intuitive. I didn’t realize that had happened until I re-read the final draft. When I purchased A Geography of Blood, it was the last copy at the big Chapters on Granville Street in Vancouver, with only a couple other copies at the other Chapters stores across the city. Before I’d gone to the big bookstore, I had tried to get it from an independent bookstore, only to find out that they couldn’t order it for me because your publisher, Greystone Books, is an imprint of Douglas & McIntyre (D&M), which recently filed for bankruptcy protection. Are you concerned about the financial prospects of this book, considering these difficulties? Yes, as the stock declined, so did my spirits. Wouldn’t that have been bittersweet: to have a book that people wanted only to have it vanish without trace in the first instant? But now Greystone has revived in a new form, and my future and the future of Geography are much brighter than they looked. In fact, one of the first things that the new Greystone Ltd. did was to order a reprint of Geography in hard cover. Unheard of. I’m thrilled and very grateful. D & M is hardly the first publisher to experience financial difficulties over the past decade. How do you envision the future of publishing? You need to ask someone much smarter than me! The trend of the moment, toward corporate giantism in both publishing and bookselling, is disheartening. Independent Canadian publishers and bookstores are really feeling the squeeze. Personally, I intend to go on going on—experimenting, adapting, blundering through—in the way I have always done, both because I don’t know what else to do and as a mode of resistance. Many of your books deal with the histories of humans, places, and creatures. I can’t help but wonder if you pursued History or Biology or Geography in university. When you were a teenager, did you envision yourself as a writer? Or was it a path full of switchbacks that led you to this career? When I graduated from high school, I had what in retrospect was frighteningly little idea of how I was going to make my way in life. I enrolled in an Honours degree program in English largely because it promised an independent study project four years in. Turned out that was what I wanted my life to be: an ongoing independent study project. Yes, I took courses in biology as part of my undergrad program, and later, at various times, contemplated continuing in history, zoology, law, medicine—once, even creative writing. But, although I applied for grad school several times, I could never make myself go. When I started to write, it seemed to have happened by accident, though it was actually the only thing I could make myself do! I went through a period of indecision and depression in my twenties, and by the time I came out of the fog, I was writing little articles, working as a freelance editor and hatching my first book. You’ve published almost 30 books over the course of your career. At what point did you realize you had “made it” as a writer? “Made it”? I’m not sure what that would mean. Aren’t we all always just beginning? What advice do you have for emerging writers? What is the next project on your horizon? I have a couple of ideas “in development” but the joyous book fuss of the last several months has been very distracting. Ask me again when the party is over! Sierra Skye Gemma is a writer and journalist based in Vancouver, BC. Her essay “The Wrong Way” won the 2012 Edna Staebler Personal Essay Contest and was subsequently published by The New Quarterly. Her nonfiction has also appeared in The Vancouver Sun, The Vancouver Observer, WestCoast Families, Fringe, and Plenitude. She can be reached online at www.sierraskeygemma.com and @sierragemma.